The #NHSHE2016 conference was more than just a poster competition and a chance to catch up with good colleagues. There was the usual full programme of talks. It was useful to hear about some of the new structures in the NHS around STPs (Sustainability & Transformation Plans AKA Sticky Toffee Pudding AKA Secret Tory Plans) with Local Workforce Action Boards (LWABs) a new one on me and seemingly a useful place to seek involvement. Within the developing STP picture there is less emphasis on organisational boundaries. A big drive for a digital ready workforce should also have implications for us – support for effective working in an online environment is something we could plug into. Louise Goswami gave a good run through on KfH progress. The patient and public area was the newest on me and it was good to get a view of the breadth of work in this area. The patient and public is not a natural match for HE based libraries – it was good to see ideas for how we can support the Trust in their work with these groups rather than perhaps taking a direct patient facing role. Sue Lacey-Bryant gave a great talk on efforts to advance “mobilising evidence and organisational knowledge” AKA Knowledge Management. There are concrete tools and training coming that can help us make this a reality which is great as I have long maintained an interest without advancing very far (see this since abandoned 2008 blog where I read Learning to Fly). There will be a campaign #amilliondecisions advocacy championing expertise of librarians and knowledge in mobilising evidence. I was really pleased to participate in an innovation presentation session. I spoke about how I made our annual reports for NHS partners more engaging and useful for all concerned. The slides are pretty simple in that they consist largely of a lightly edited version of the report. The style is very much based on that used by the University of York for their action plans. The talk was well received – both in terms of winning first prize in a public vote but also in terms of people discussing it with me afterwards. I had a similar experience when I shared it with colleagues in my local network so it was great to be able to spread this further. I plan to follow up in the Spring to see if any NHS colleagues have gone with it following the talk. 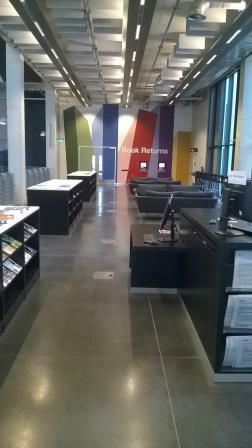 I recently had the opportunity to tour the University of Greenwich Library on Stockwell Street. It is always interesting to have a poke around someones library – particularly when it is a shiny new one like this (opened September 2014). 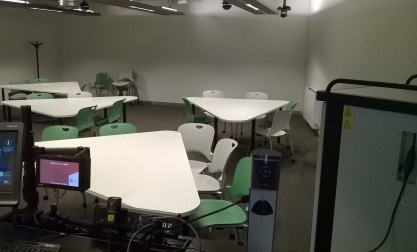 I am also involved in lots of discussions about future library spaces at work so it was very helpful to see some of the new style fixtures in operation. 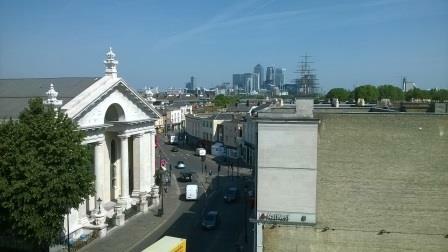 I was a bit grumpy when I realised that the Library had been built on what was my favourite market in Greenwich. The small consolation is that they were going to build flats on it otherwise. 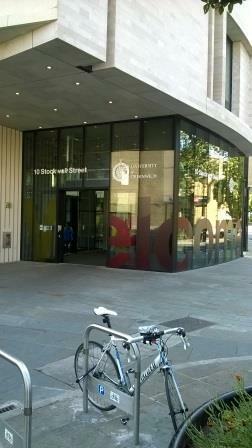 The entrance is rather nice with a general reception before you reach the library gates. There is plenty of open space on the ground floor. 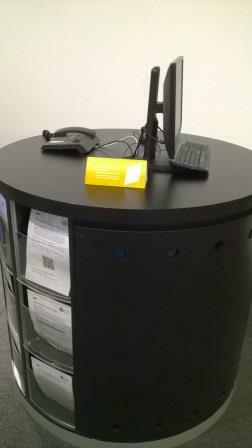 To the right of this shot is a single person desk for directions and to support use of the self issue kiosks. The white units hold a few paper titles (architecture students use this site amongst others) and have new books displayed on top. 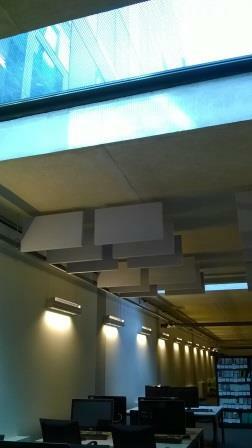 The interior is all brushed steel and polished concrete with predictable results – note the ceiling mounted baffles. There are lots of different kinds of seating. 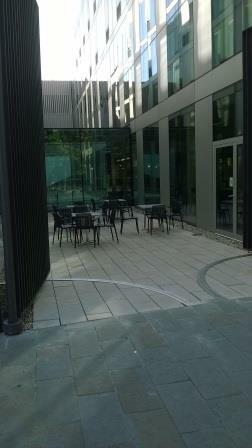 Those below faced the chairs outside and have power and data sockets concealed underneath which is neat but probably not the most convenient. 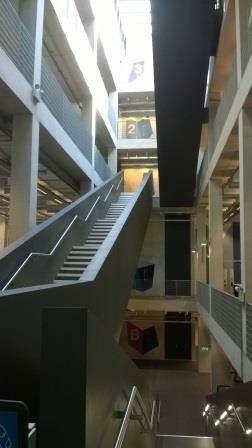 A set of enormous stairs run through the centre of the building. 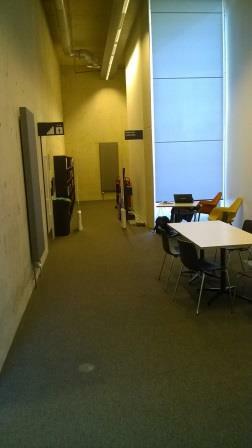 On the other side of the stairs is this rather nice space with a variety of work environments. 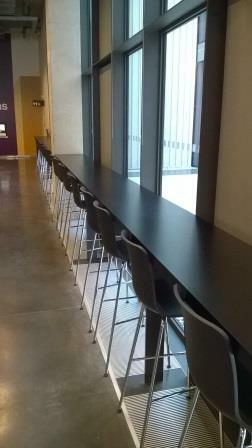 The grey soafs on the right face each other over coffee tables providing space for around six people to work together. The bright chairs are each by a tall window looking outside. Short loan is back the other way with self issue inside the gate to control access. 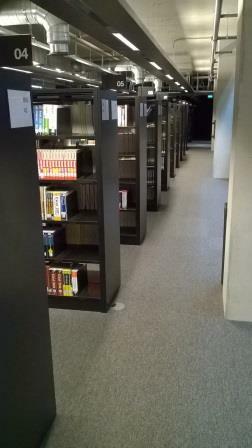 Print areas are divided from the rest of the library by mid height walls. This one down past the big grey sofas housed loan laptops for use in the Library. 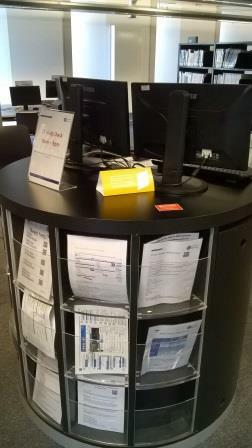 I like this idea as it provides flexible access which would be inclusive to all the users of our libraries. 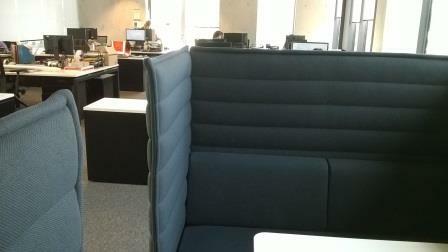 There are clusters of group work oriented sofa pods with high backs to provided some privacy and contain noise. The fixed PCs are generally quite closely packed which is similar to the arrangements we have in place. It would be nice to be able to offer more space for peoples stuff around PCs. Wandering down into the basement we passed an enquiry point. 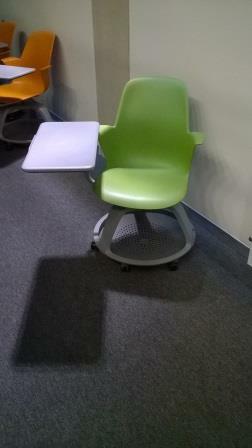 These are located around the library rather than having a single desk near the entrance. 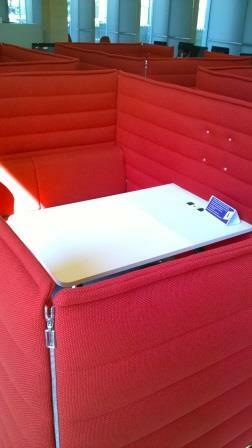 Help leaflets are integrated into the furniture. Not pictured are the archives who are located in the basement with some very fancy rolling stack. Shelving is generally not too high and slinky black. The dark space in the distance of the left hand picture was in eco motion sensitive lights out mode (it was early when I visited). 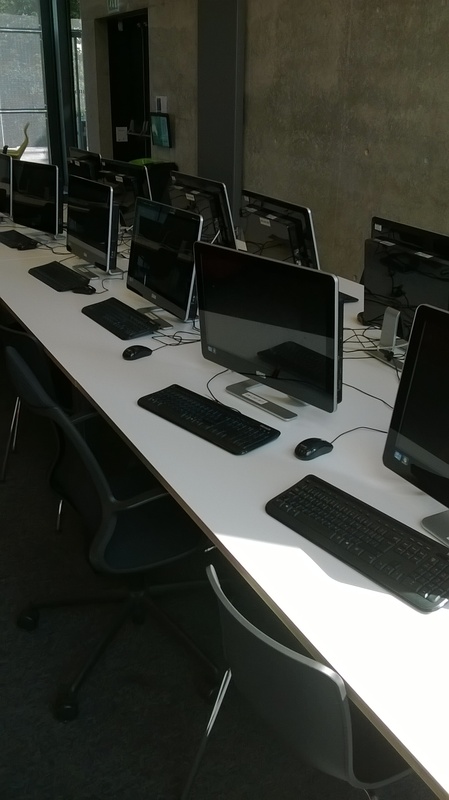 There are clusters of desks and PCs scattered around. 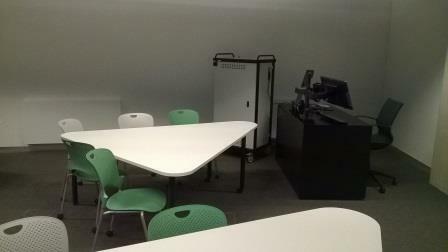 The training room is highly flexible with all furniture on wheels and capable of multiple layouts. This struck me as a really good idea. Laptops allow the use of the space for hands on training though there would obviously be an overhead in set up time. 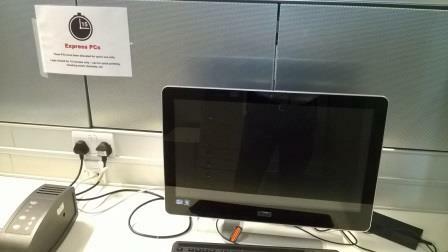 IT have enquiry points too (note the double screen ahem). 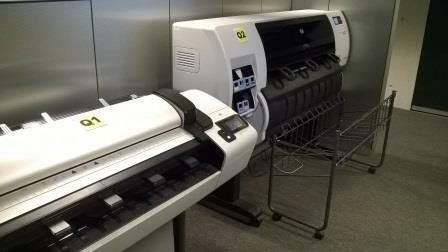 Printing areas have PCs to allow people to hop on to print something off which is a nice touch. 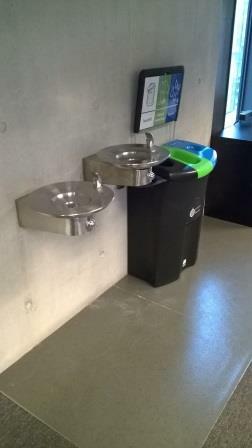 There are plenty of water points along with toilet facilities. 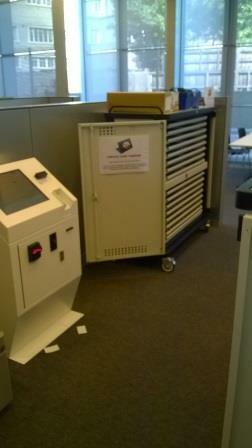 The needs of the architecture students mean that poster printers are self serve and very economical. 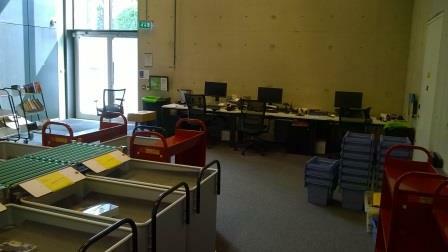 The main staff office is on the top floor (plus some palatial quarters behind the book sorter down stairs). We finished our tour at the staff meeting room which has a rather nice view. 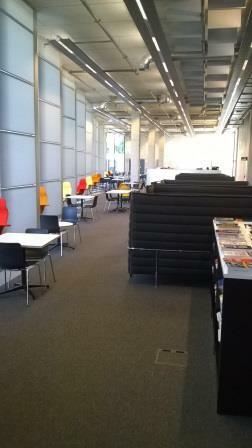 I was impressed with the range of study environments in the library (not pictured are some group study rooms). The library has a number of roof top gardens with some open for library users. Thanks to UoG colleagues for the welcome!